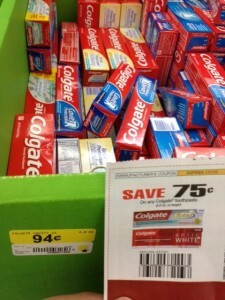 If you got yesterday's paper, you can get a good Colgate deal at Walmart! You can find these toothpastes in cardboard bins, usually in the middle of the main aisle. Thanks, I Heart the Mart for the deal and photo!